Crispy, buttery and sugar free waffles. 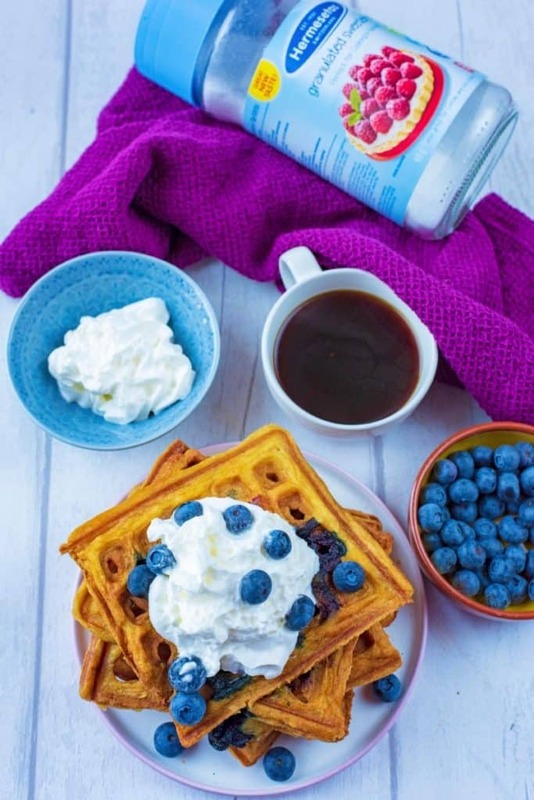 These fluffy Blueberry Waffles are one of the easiest ways to get you out of bed in the morning and by using Hermesetas Granulated Sweetener we have given them a lighter twist. You can easily freeze them too, making the a great make-ahead breakfast to save you time on a busy weekday morning. We have either pancakes or waffles every Sunday, it has become a bit of a tradition. 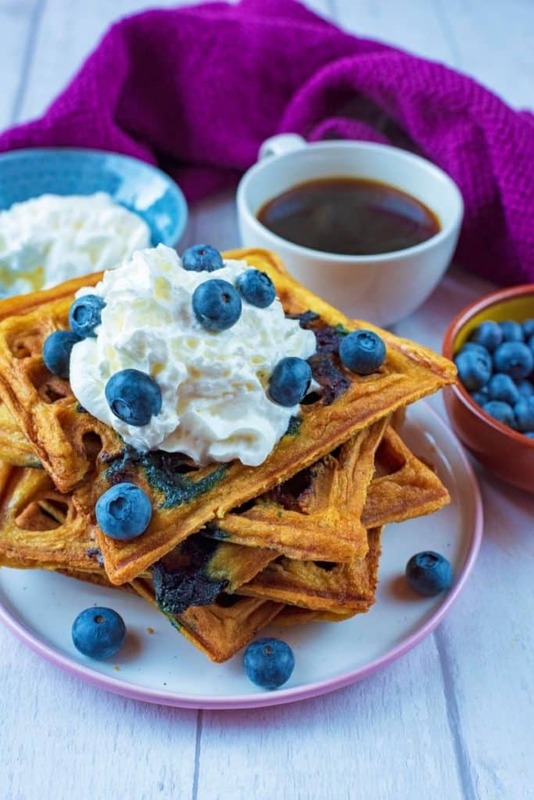 These waffles are bursting with blueberries that pop with every bite, so they have become a firm favourite. 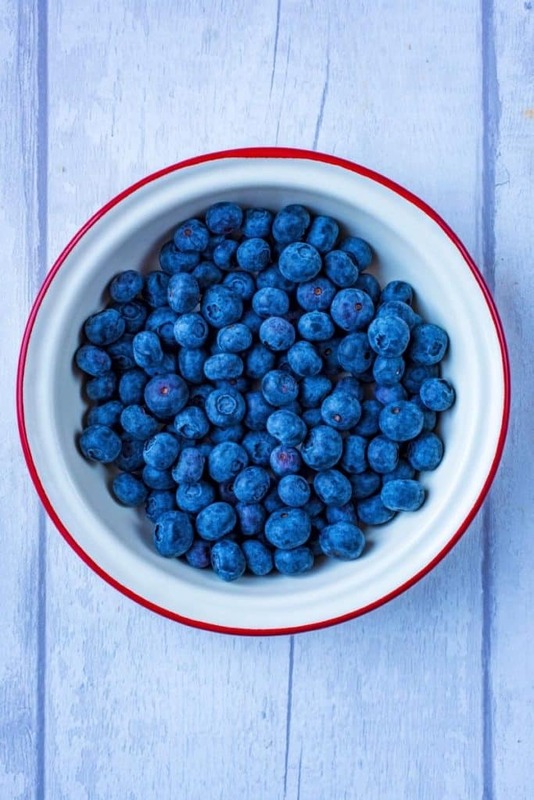 If you have quite a few blueberries that need using up, this is perfect as you need quite a few for this recipe. You don’t have to use blueberries though. We have made this recipe with chopped up raspberries and cherries (chopped up because they are bigger) and they work just as well. You could even use a mixture of berries – that would be very colourful. 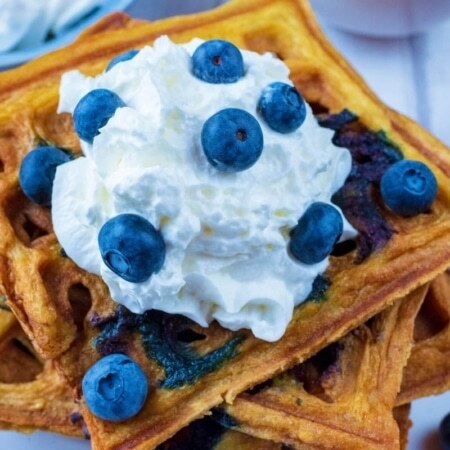 Although you get some sweetness from the blueberries in these waffles, it does need some extra sweetness. It is a sweet breakfast after all. 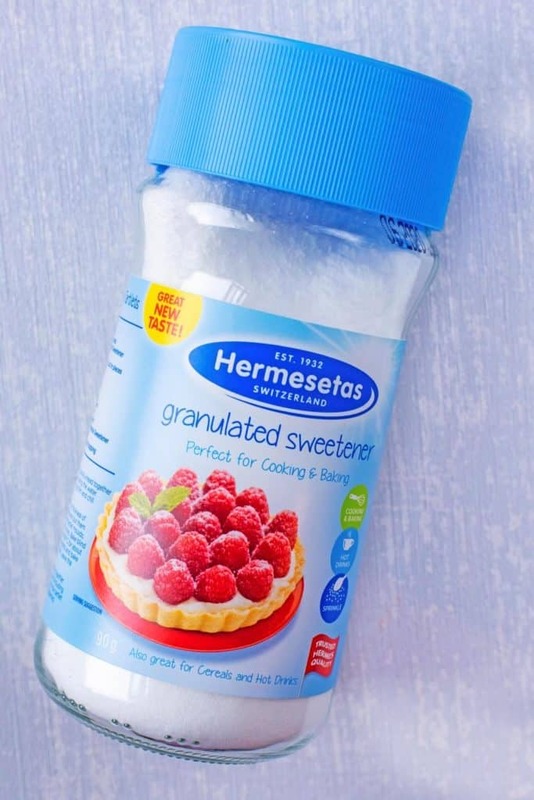 I am trying to keep my sugar intake to a minimum during pregnancy, so we are using an alternative in our recipes – Hermesetas Granulated Sweetener. It is a great (and easy) sugar swap and if you haven’t tried it before, you should give it a go. Why use Hermesetas Granulated Sweetener? One teaspoon of Hermesetas provides the same degree of sweetness as a teaspoon of sugar, but with no or a very low amount of calories. Which means these waffles are just as sweet as they would be if we used sugar, but less calories. NHS Choices says: “Like sugar, sweeteners provide a sweet taste but what sets them apart is that, after consumption, they don’t increase blood sugar levels”. If I have a sweet breakfast, I usually get a sugar crash by 11am, but that doesn’t happen when I make this sugar swap. We have been using Hermesetas Granulated Sweetener in our baking, sweet breakfast and hot drinks for about a year now and I have noticed such a difference in my energy levels, but no difference in taste of our recipe. Of course another added bonus, if it’s something you are being conscious of, is that sweetener is lower in calories. Switching sugar to low calorie sweeteners like Hermesetas can reduce your daily calorie intake by 10% and lead to a statistically significant weight loss of 0.2kg (0.44lbs) a week. I have found this especially true with hot drinks, where it is so easy to drink half your daily calories. I use this in my tea and coffee now too. It is readily available too and you can pick it up in Asda, Tesco, Morrisons and Sainsbury’s to name a few and it’s also easy to use in all your favourite sweet treats. Have you tried our Cranberry Orange Muffins or Healthy Chocolate Raspberry Brownies? They both use this sweetener. As all Hermesetas products are heat-stable, so they won’t lose their sweetness even when exposed to the high temperatures involved in baking. Don’t be nervous about making this swap with all your favourite recipes, as it’s a really easy swap. Head over to the Hermesetas website to see some more delicious recipes and ways to create sweet and healthy dishes. 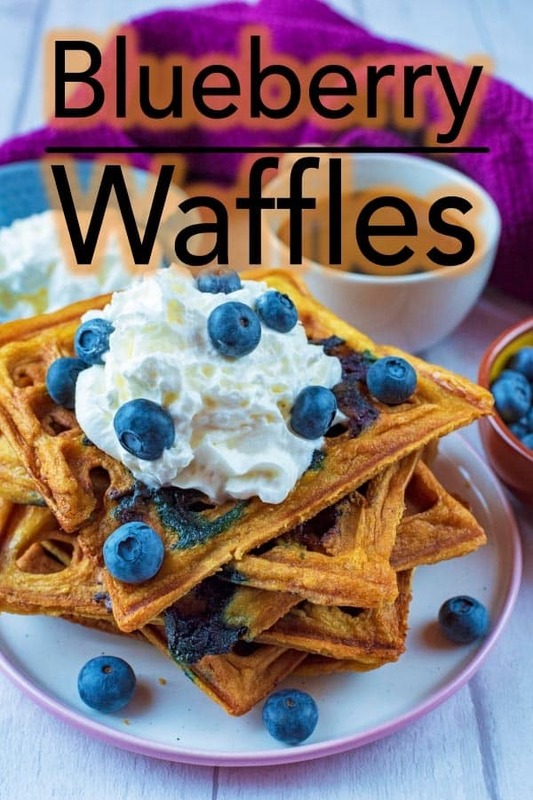 You can use wholewheat flour to make these waffles, however it will make them quite heavy. We like a nice light waffle, and using plain flour helps that. Can You Freeze Blueberry Waffles? These waffles are perfect for freezing. Just wrap them individually in grease-proof paper and stack them and then they will keep in the freezer for 3-4 months. You can either reheat them in the microwave or put them in to the toaster. Once you have made these easy waffles, it’s all about the toppings. We kept it simple with something creamy and some extra blueberries of course. We used reduced fat squirty cream, but you could swap that for Greek yoghurt for a lower fat alternative. For something a little more indulgent, a little sprinkle of dark chocolate chips would be a delicious addition. One: Put the flour, Hermesetas Granulated Sweetener and baking soda in to a large bowl and mix. Two: In a smaller bowl, whisk the egg and add the milk, vanilla and melted butter and mix well. Four: (not shown) Oil your waffle iron and pour half the mixture in to it and close the lid. Cook according to your waffle iron instructions. Ours took around 3-4 minutes to cook. Repeat with the rest of the batter mixture. Serve with yoghurt or cream and extra blueberries on top. The amount of waffles this mixture makes and cooking times will vary depending on the waffle iron you are using. Always consult your user manual for cooking instructions. We topped our waffles with reduced fat squirty cream, however you could swap it for Greek yoghurt for a low fat alternative. Not a fan of blueberries? You could use cherries or raspberries instead. These waffles freeze really well, so wrap them up and pop them in the freezer. Defrost overnight and re-heat in the microwave for a quick and easy breakfast. Do you want to be kept up to date on more delicious posts like this recipe? Please subscribe to the blog mailing list (it takes 30 seconds). 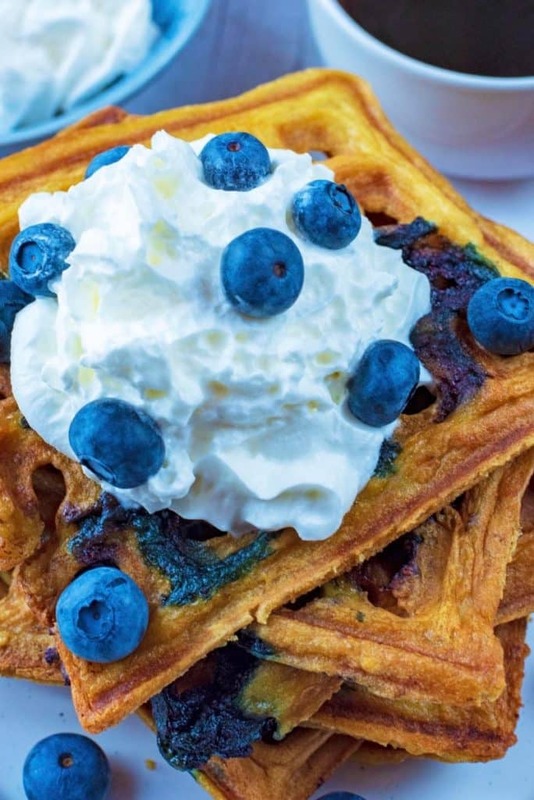 These fluffy Blueberry Waffles are an easy way to get you out of bed in the morning. They are a great make-ahead breakfast to save time on a busy morning. Put the flour, Hermesetas Granulated Sweetener and baking soda in to a large bowl and mix. In a smaller bowl, whisk the egg and add the milk, vanilla and melted butter and mix well. Oil your waffle iron and pour half the mixture in to it and close the lid. Cook according to your waffle iron instructions. Ours took around 3-4 minutes to cook. Repeat with the rest of the batter mixture. Serve with yoghurt or cream and extra blueberries on top. the waffles look delicious! I tried to make them immediately, and they are really delicious. They are very easy to make and quick to finish, another plus point. They are very airy and crunchy, even the berries are a perfect combination. At home they all loved it, even the ones who don’t like sweets or who are on a diet! I’m going to recommend this recipe to everyone who likes healthy candy. Waffles are delicious but can be so sugary! I love that this is “sugarless”. I love the sweetener substitute, was great. Everyone enjoyed! This looks delicious! I didn’t even think sugar free waffles were possible! These sound SO good! We often make waffles, but other than plain waffles with syrup I’m never sure what else to do. Will definitely give these a try next time. Love this warm and cozy recipe! Will definitely be making this one again and again! Made these today for my husband, myself, my mom, and my stepdad(who’s VERY picky! ) and they were a HIT with everyone!! Thank you! Mmm…pancakes or waffles every Sunday? Wish I lived in your house :). Delicious! These waffles look gorgeous and it’s a great idea to use hermesetas instead of normal sugar. I should swap to hermesetas in coffe and tea too! Thank you for sharing, this recipe looks amazing! I have to admit though, I’ve never tried waffles before but I’ve always wanted too! I have a pint of blueberries in my fridge right now that I need to use up so this will make the perfect breakfast for my family. Thanks for sharing!